RT1 finalises development and release of UKESM1, including user support. RT1 will also carry out CMIP6 experiments that form the basis for the science objectives of the project. RT2 emphasizes evaluation of UKESM1, performed both at the process-level (RT2.1), and for the fully coupled ESM (RT2.2). RT3 emphasizes scientific analysis of Earth system projections, including investigation of emergent constraints to reduce uncertainty in future feedbacks. 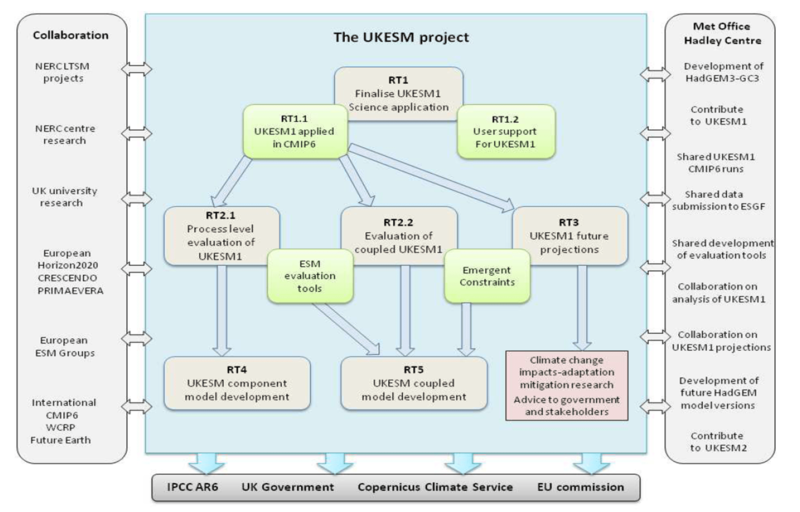 RT4 develops the component models for future UKESM, while RT5 targets improvement of fully coupled versions of UKESM. 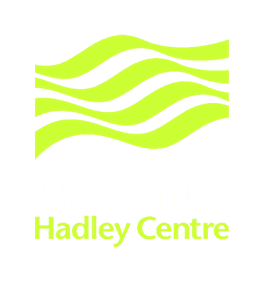 Atmospheric Chemistry: UKCA interactive stratospheric-tropospheric chemistry including trop. isoprene chemistry (Morgenstern 2009, O’Connor 2014). 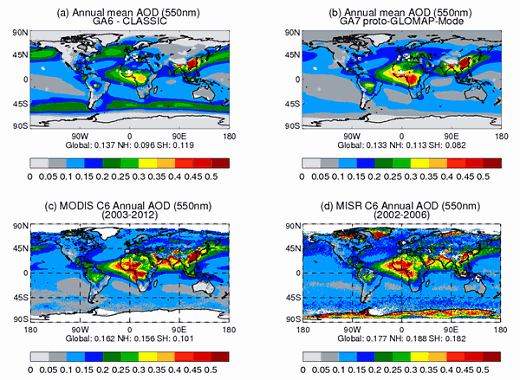 stratosphere-tropospher aerosol scheme (Mann 2014). 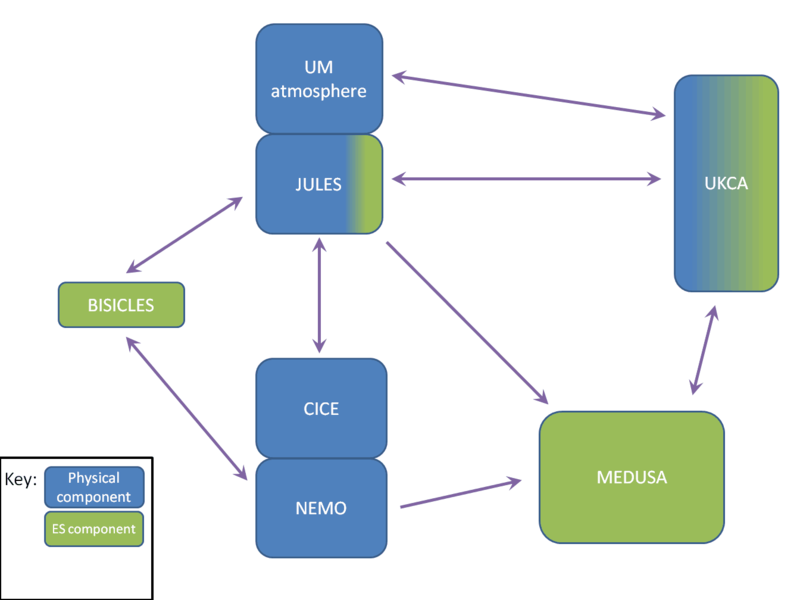 Ocean biogeochemistry: MEDUSA2 intermediate complexity plankton ecosystem model (including prognostic DIC, alkalinity, dissolved O2, detritus carbon with variable C:N) (Yool 2013). Terrestrial biogeochemistry: TRIFFID vegetation dynamics (9 PFTs), prognostic soil carbon, Nitrogen-limitation scheme, diagnostic wildfire, improved permafrost treatment and wetland CH4 emission. 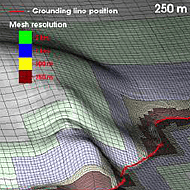 Ice sheets: BISICLES land ice sheets for Antarctica & Greenland (Cornforth 2013).